FIAC quiet rotary screw air compressors are available in a wide variety of models, which range from 3-50 HP. The FIAC Silver air compressors are easy to service, adopt an advanced encapsulated air end minimizing connection points, and allow for optimal use of cabinet space. Designed for performance and reliability, the FIAC silver air compressor model comes equipped with a TEFC high-efficiency electric motor, WYE Delta Starter, Sound attenuating enclosure, FIAC easy control microprocessor panel, after cooler, thermostatically controlled axial cooling fan and two stage vibration isolation to further reduce noise levels. 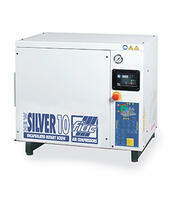 Our most popular models are the Silver 10, Silver 15 and Silver 20 air compressor model numbers.